December 12, 2017 – Junior Achievement is the country’s biggest organization helping young people gain the knowledge and skills they need to achieve economic success, plan for the future, and make the best academic and economic decisions. Their programs focus on work readiness, entrepreneurship, and financial literacy. The Greater Washington service area includes 17 counties, including the District of Columbia. Omega World Travel is a proud sponsor of Junior Achievement, with a storefront in Finance Park, just down the street from Omega’s headquarters in Fairfax, Virginia. The JA Finance Park experience is an in-depth lesson in how to manage personal finances. Teachers first educate their students using Junior Achievement’s fourteen-lesson curriculum to give them the necessary skills to participate. Upon arrival at JA Finance Park, students sit through an orientation and are assigned a life scenario, including their occupation, salary, credit score, family members/dependents, and financial obligations. They then use this information to calculate their monthly income, set a savings goal, and create a budget. Once that is completed, participants “go shopping” at each storefront to see what actual costs would be, then pay using a debit card or online payment. Each year, Omega invites several Junior Achievement students, along with their principal and other faculty members, to our holiday luncheon. 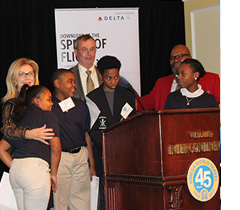 This year, each student received a domestic trip with Delta and two nights at an Extended Stay property.